Metro Vancouver disposes of about 10,500 tons of styrofoam a year. But did you know that only 21% of the styrofoam is actually recycled? This statistic led Metro Vancouver to ban styrofoam disposal in landfills last year on June 1st, 2018. The ban encourages residents and businesses to dispose of the material at a recycler instead, where it’s either remade or repurposed. The region achieved this by placing a surcharge at local transfer stations on all styrofoam received at their facilities. An extra tipping charge deters residents and businesses from landfilling styrofoam. Still, thousands of styrofoam-based products end up in landfills, most commonly as single-use styrofoam containers, shipping packages, and disposable cups. Many of these items end up in landfills instead of being recycled. You might be wondering – why? Why is so much styrofoam being disposed of in landfills? Only 21% of styrofoam is recycled in Metro Vancouver. Why Styrofoam Is Difficult to Recycle? One, rules on how to dispose of styrofoam can be confusing. It takes time for residents and businesses to change their disposal habits. We’re so ingrained into our old habits of dumping styrofoam in garbage without realizing there are other ways to dispose of them. Recycling styrofoam can be confusing, too. After all, we encounter a plethora of materials all throughout our lives. No one knows everything about every material and where they should go. To complicate matters, recycling rules about styrofoam can vary city by city. For example, in Surrey, although styrofoam can be recycled, you’re not allowed to place them in your recycling bin. Styrofoam must be taken to an appropriate recycler instead. Did you know: Although styrofoam take-out food containers show a recycling icon on the bottom, it cannot be placed in your recycling bin. Two, commercial and industrial businesses generate a lot of styrofoam waste. Styrofoam – expanded polystyrene – is known for its lightweight attributes. A durable material, businesses use styrofoam as a favourable material for a variety of purposes. Styrofoam can be found in film props, packaging material, and take-out containers. Cost can restrict these businesses from changing to more environmentally friendly materials. Commercial and industrial businesses use styrofoam because of its lightweight attributes. Three, food often contaminates styrofoam, making it impossible to be recycled. Unlike grease covered pizza boxes, food-soiled styrofoam containers cannot be recycled. Made out of cardboard, grease-covered pizza boxes can go in your organics bin, but not styrofoam – since styrofoam is a non-biodegradable material. Also, because styrofoam is porous, food particles seep into its components, making it difficult for a recycler to clean and reuse. But why should we do our part to recycle styrofoam? Residents and businesses may wonder since the cost of recycling styrofoam can be time intensive and costly. However, think of all the disposable food plates and cups thrown out in the garbage on a daily basis. Think about the styrofoam cluttering up local landfills, from take-out food containers to disposable cups. Also, now that people choose to have items delivered to their homes, lots of styrofoam packaging ends up in the garbage. 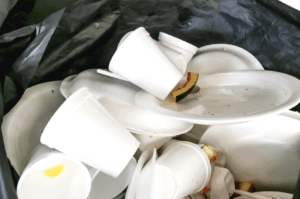 Styrofoam makes up most of the disposable food plates and cups thrown out in the garbage. With more people learning about the impacts of styrofoam, it becomes easier for people to change their styrofoam disposal habits. Likewise, more sustainable alternatives can be made, from using biodegradable take-out containers to sourcing sustainable shipping packaging. 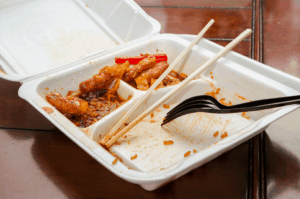 Food scraps in a styrofoam takeout container attract unwanted pests. For Vancouver residents, recycling styrofoam can be as simple as recycling aluminum cans. Many bottle recyclers accept styrofoam for recycling. The styrofoam they receive is diverted from landfills. 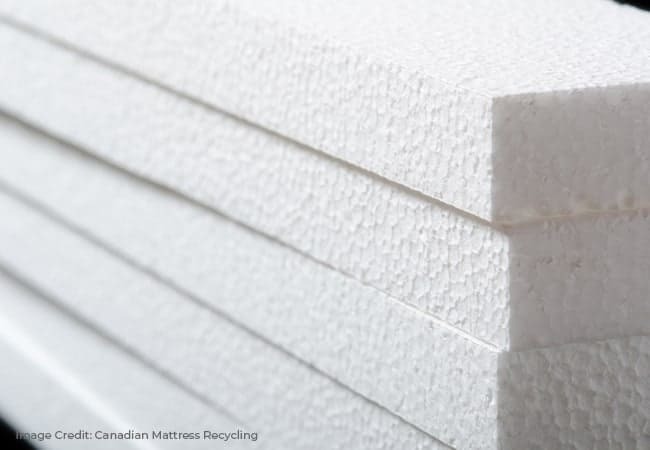 Businesses such as London Drugs also accept styrofoam packaging back for recycling. Therefore, the ban on styrofoam disposal in Metro Vancouver was the first step in recognizing styrofoam’s impact on the environment. And soon – Vancouver will ban single-use styrofoam containers and cups from being disposed of in the garbage. Coming to the city on June 1st, 2019, businesses in Vancouver will need to source other take-out containers and cups instead. 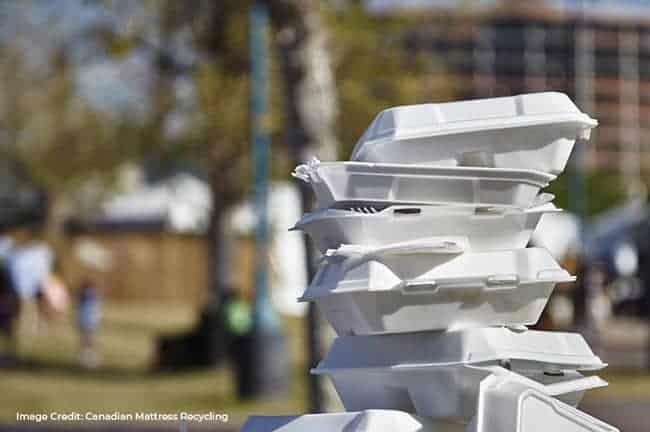 Because styrofoam is a difficult material to recycle, many cities are following Vancouver’s lead in banning them outright. This has led businesses scrambling to find alternatives to styrofoam containers. Reusable containers, cutlery, and cups are simple alternatives to styrofoam ones. A quick rinse under the kitchen sink or dishwashing containers allows them to be used over and over again. A reusable metal or glass container leaves less impact on the environment than styrofoam based ones. Unlike petroleum-based plastics like styrofoam, residents can compost mushroom-based packaging easily. Mushroom farms have a low-carbon impact. Now it is possible to purchase biodegradable packaging peanuts made out of wheat and cornstarch. We hope you find this article useful about how to recycle styrofoam, why it’s important, and alternatives to using styrofoam. Although styrofoam is known for its lightweight attributes and durability, the plastic is difficult to recycle. Because of its effect on wildlife, inability to biodegrade, finding a more sustainable alternative can mean a world of difference. 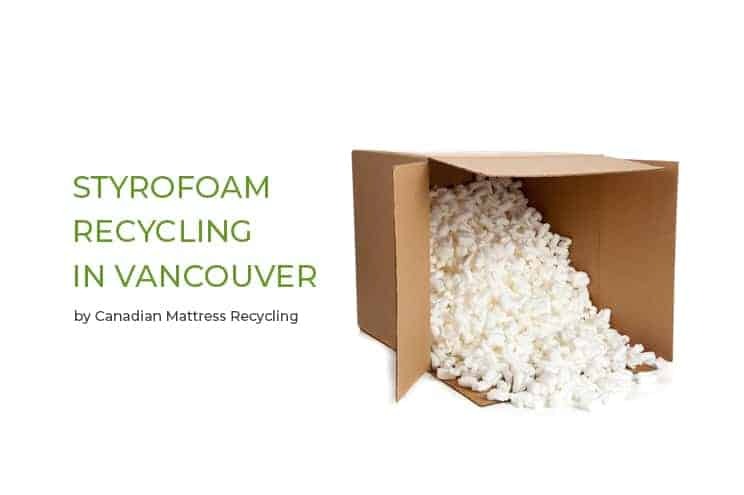 Canadian Mattress Recycling Inc. is Metro Vancouver’s leading mattress recycler. Since opening our doors eight years ago, we have recycled over 25 million lbs of mattresses and upholstered furniture. We dismantle, recycle, and reuse 100% of all items we receive. We are proud environmental leaders, paving the way for a more sustainable, climate-smart future.